Understanding the key qualities of a strong communications team will enable you to deliver effective comms, build the profile of your charity and secure buy-in from colleagues. Having won the Third Sector Award 2016 for Communications Team of the Year, domestic abuse charity Refuge proves that being a small team doesn’t stop you making an impact. 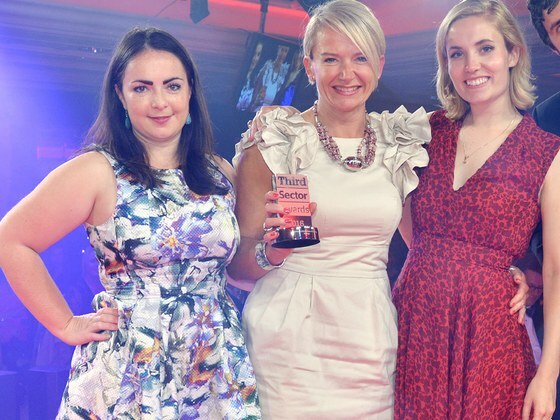 Skill set, passion and being prepared to muck in are some of the key elements of an award-winning communications team. The Refuge communications team is small (there are three staff members – pictured here from left to right are Emily Wight, communications executive, Lisa King, director of communications and fundraising and Lucy Snow, copywriter and editor), so it’s important they all communicate well with each other. “We’re not just good at written communications and social. We are all-round good communicators. We communicate with each other constantly, checking in with each other when the pressure is on,” says Lisa. The team is also good at delivering constant dialogue with external audiences, such as journalists. They keep the media updated on case studies, thank them for articles they write and let them know they’re playing a key role in promoting the charity’s work. Communications teams need to feel valued by their colleagues. At Refuge, communications is considered an integral part of the charity’s work. “Communications is a service in its own right, a pre-service to the frontline service, raising awareness to help women and children access vital information and support,” says Lisa. There is a positive working culture at Refuge, and the chief executive is very supportive of communications. “Our chief executive is a big believer in communications. She is an amazing campaigner and is very media savvy. Before I started at the charity 14 years ago, she was delivering the function by herself,” explains Lisa. Senior managers and other colleagues at Refuge understand that communications is important in supporting the “bigger picture”, helping them to win contracts to deliver domestic violence services, fundraise and increase brand visibility. Lisa explains that communications is also increasingly embedded into the delivery of new contracts, as staff and commissioners begin to see the value of raising local awareness. Communications teams have to be prepared for the unexpected, and when the unexpected does hit, they need to be ready to park other work. “When things come at you at 1,000 miles per hour, you have to be prepared to ride the wave and roll up your sleeves,” says Lisa. Earlier this year, the communications team worked quickly and creatively to maximise an unexpected fundraising campaign to raise money for Refuge in support of a character from Radio 4’s The Archers. As money has poured in, raising almost £170,000 to date, the team has thanked every individual for their donation on social media. They were also quick to demonstrate to supporters the impact their donations were having on frontline services, so that individuals could see that their contributions were making a difference. Even before the fundraising campaign started, the team was hot on the heels of The Archers’ storyline on domestic violence, creating a suite of content and collateral to share on social media. They called out the abusive behaviour as it happened and shared vital messages on spotting the signs of domestic violence. It’s important that members of a communications team can see the tangible difference they’re making. At Refuge, there is a direct correlation between the work the team does and the impact it has on frontline services. For example, all collateral used in the Archers campaign included information on where women could seek support. As a result, Refuge saw a 16% increase in visits to its website, particularly the ‘Am I experiencing abuse?’ pages. Refuge is not shy about challenging perceptions and views. It regularly shares myth-busting facts on social media and is not afraid to put its head above the parapet and speak out in support of the needs of women. Pro bono support is invaluable when you're a small communications team. Although not all companies can provide free services, especially small businesses, some suppliers may consider it as part of their CSR policies. Refuge works with suppliers including an advertising agency, a photographer, and designer, on a pro bono basis. Lisa says they've contributed to the team's achievements, acting as extended members of the team. A strong communications team always plans ahead, and the Refuge team has lots of exciting projects planned over the coming months. These include marking the charity’s 45th anniversary in November and launching advertising campaigns. Kellie Smith is a freelance copywriter, editor and proofreader, with over seven years of communications and content experience with charities. Before working in the third sector, Kellie worked in journalism and copywriting across a range of trade and consumer titles.